The Food and Nutrition Board (FNB) of the U.S. Institute of Medicine updated Estimated Average Requirements (EARs) and Recommended Dietary Allowances (RDAs) for vitamin E in 2000. The current EAR for vitamin E for women and men ages 14 and up is 12 mg/day. The RDA is 15 mg/day. RDAs are higher than EARs so as to identify amounts that will cover people with higher than average requirements. RDA for pregnancy equals 15 mg/day. RDA for lactation equals 19 mg/day. For infants up to 12 months the Adequate Intake (AI) is 4–5 mg/day and for children ages 1–13 years the RDA increases with age from 6 to 11 mg/day. The FNB also sets Tolerable Upper Intake Levels (ULs) for vitamins and minerals when evidence is sufficient. In the case of vitamin E the UL is 1,000 mg/day.Collectively the EARs, RDAs and ULs are referred to as Dietary Reference Intakes. The European Food Safety Authority reviewed the same safety question and set a UL at 300 mg/day. 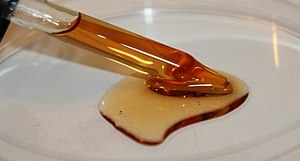 Vitamin E was discovered in 1922 by Herbert McLean Evans and Katharine Scott Bishop and first isolated in a pure form by Gladys Anderson Emerson in 1935 at the University of California, Berkeley.Erhard Fernholz elucidated its structure in 1938 and shortly afterwards the same year, Paul Karrer and his team first synthesized it. Later, in 1948, while conducting experiments on alloxan effects on rats, Gyorge and Rose noted rats receiving tocopherol supplements suffered from less hemolysis than those that did not receive tocopherol. In 1949, Gerloczy administered all-rac-α-tocopheryl acetate to prevent and cure edema. Methods of administration used were both oral, that showed positive response, and intramuscular, which did not show a response. This early investigative work on the benefits of vitamin E supplementation was the gateway to curing the vitamin E deficiency-caused hemolytic anemia described during the 1960s. Since then, supplementation of infant formulas with vitamin E has eradicated this vitamin’s deficiency as a cause for hemolytic anemia. According to one meta-analysis, nine cohort studies showed that high intake of tocopherol was associated with a lower risk of cardiovascular diseases compared with lower intake. In this study, higher dietary, supplementation and combined vitamin E intake was also associated with lower disease incidents. In 1993, a study of 39,919 male health professionals aged 40 to 75 showed that consumption of more than 60 IU of vitamin E (any form) per day was associated with a lower incidence of coronary heart disease compared with less than 7.5 IU/day intake. This study also showed an inverse association between vitamin E supplementation and the incidence of heart disease.